According to Zack Friedman of Forbes, the average college student will graduate with $40,000 in student loan debt. As such, it is important for undergraduates and graduates to select the student loan that best suits their needs so as not to be weighed down by any unnecessary loans. Nevertheless, there are a plethora of student loans to choose from, and picking the right one is a task easier said than done. Fortunately, some basic understanding of each type of student loan will illustrate which one best suits your educational situation. Brianna McGurran of NerdWallet states that the two major types of student loans are federal loans and private loans. As their names imply, federal loans are issued by the U.S. government, while private loans are handled by private financial entities. There are advantages to both of these types of student loans. Justin Pritchard of The Balance explains that federal loans are more obtainable for students from low-income families. In fact, there are certain types of federal loans that are only issued to students who demonstrate financial need. Meanwhile, McGurran states that private loans can be used toward more specialized fields and careers. For example, many private student loans are crafted specifically for medical students. Now that the two major categories of student loans have been examined, it is time to explore the different types of federal loans. The U.S. Department of Education separates federal student loans into two major categories: subsidized and unsubsidized loans. The Huffington Post explains that subsidized student loans are offered to students who demonstrate financial needs. These loans often have specific guidelines that students must meet in order to keep borrowing money through them, such as being enrolled at least halftime. On the other hand, unsubsidized loans are offered to students regardless of financial need. Still, if students are eligible for a subsidized loan, The Huffington Post suggests that they take out one of those first, only taking out an unsubsidized loan if they face additional collegiate costs. Much like federal loans, private student loans come offered with a number of different financial options. Unlike with federal loans, however, Friedman explains that private loans are issued by a private financial entity, such as a bank or a credit union. As mentioned earlier, private loans are often specialized for a specific field of study or career. Due to this fact, McGurran says that many students who go to law school or medical school take out a private loan rather than a federal loan. Some such examples of specialized private loans include bar exam loans and medical school loans. Additionally, many graduate students have acquired an established credit score by the time they graduate from their first four years of college, making it easier for them to apply for one of these private loans. No matter which type of loan you take out for your college education, the Department of Education emphasizes the importance of responsible borrowing. Students should keep track of how much they are borrowing, as student debt can quickly add up. 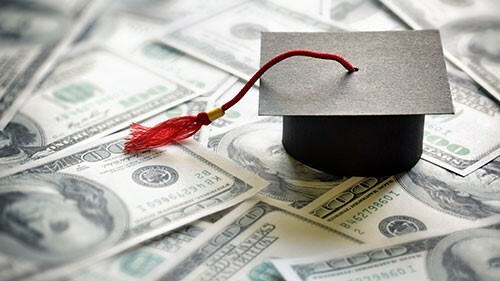 Additionally, the Department of Education says that students should look into how much they will earn right out of college, depending on their career path. Doing so will illustrate how long students will have to pay off the debt that they have accumulated by taking out loans. Post-college debt is something that no young adult wants to deal with right after graduating. By carefully choosing the right kind of student loan, you can help pay your way through college without having to repay your debt for years to come.